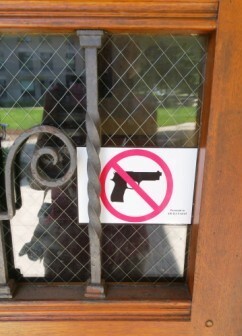 Chicago is definitely my kind of town. My visit to this dynamic city where I studied and worked for several years long ago was, for me, a highlight of our recent U.S. voyage. Husband Bob (Bicycle Bob/Vino Roberto) and I also enjoyed visits with friends and family in Virginia and New York City, attended a reunion in Maryland, shopped, ate good food — and had a grand time. A former college roommate, Beverly, was my guide extraordinaire in the Windy City. 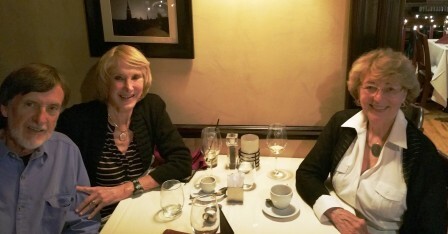 Bev and I, both French majors, roomed together in the French corridor of a dorm in our senior year at Northwestern University in Evanston just north of the city. We were supposed to speak only French. (I think we broke that rule.) 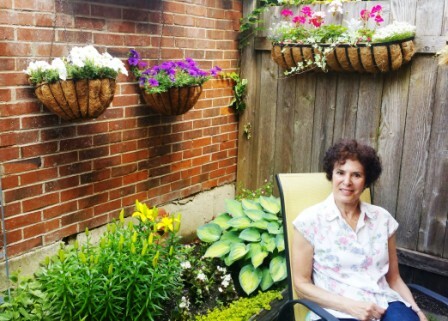 Bev went on to get a PhD in French, taught at Yale, but eventually moved back to Chicago. She lives in Lincoln Park, not far from where I lived when I worked in the city, and now works part time as a Chicago guide, giving tours in French. She knows – and loves – the city, and gave me an outstanding tour – in English. So much has changed, and it’s all overwhelming, fabulous. 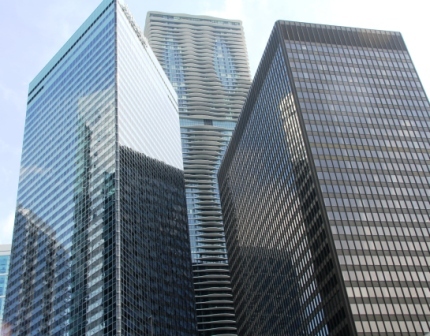 Chicago, the third largest city in the U.S., has always been known for its bold architecture. 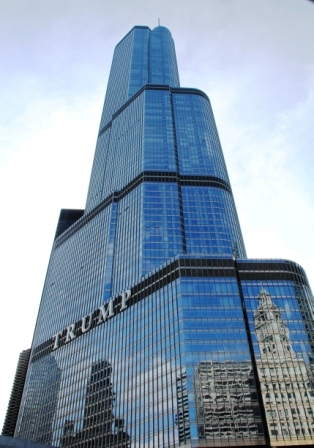 The first skyscraper was erected in the city in 1885. 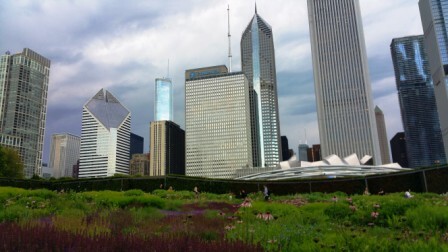 Today its sky is the background for a myriad of innovative and beautiful tall buildings, including the Willis Tower, formerly the Sears Tower and the second tallest building in the U.S. With 105 buildings at least 500 feet (152 m) tall, Chicago is said to have the tallest skyline in the country and the third-tallest in the world. 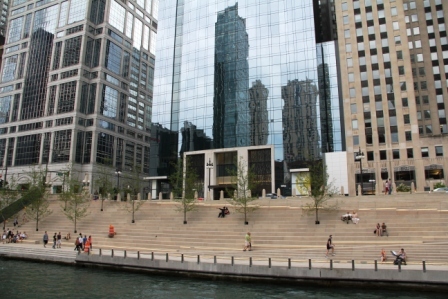 A great way to see these buildings, and learn more about the city’s architectural history, is the architecture tour by boat on the Chicago River. As our boat wended its way past one magnificent building after another, Bev’s friend and exuberant guide Judith provided fascinating commentary. 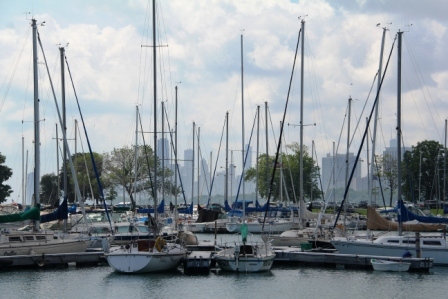 Bev drove me through Hyde Park and parts of south Chicago, regions of the city I had never explored. I wanted to take a photo of Obama’s house, but there is not much to see. It is hidden behind lots of trees and bushes, and there are security barricades all around, as well as guards. 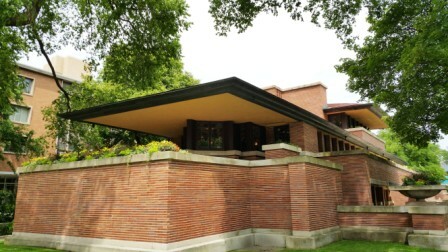 We stopped at Frank Lloyd Wright’s Robie House, built in his Prairie style between 1908 and 1910 and now a National Historic Landmark. 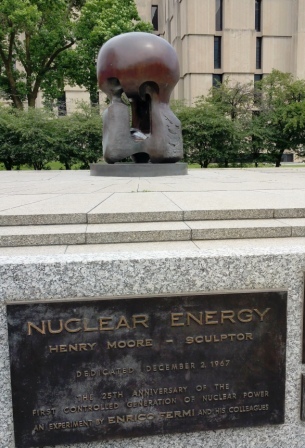 We stopped at another National Historic Landmark, a Henry Moore sculpture on the University of Chicago campus marking the site of the first self-sustaining nuclear reaction on Dec. 2, 1942. This explains Bev’s ties to Hyde Park, where she was born, and the University of Chicago, where she did her graduate studies. 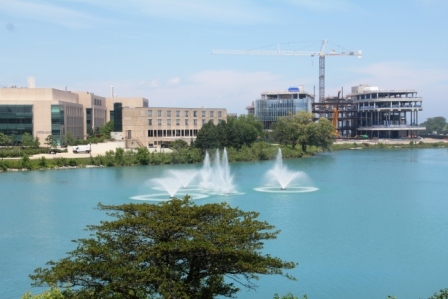 Northwestern campus with more construction underway. She led me on another excursion to the site of our undergraduate studies — Evanston and the Northwestern campus. Progress there is also monumental, with many new buildings, many built on land that was once Lake Michigan. The campus can only expand in the direction of the lake, so more of the lake has been filled to provide needed terrain. We walked by many old buildings which brought back many memories. We found the dorm where we originally met long, long ago. 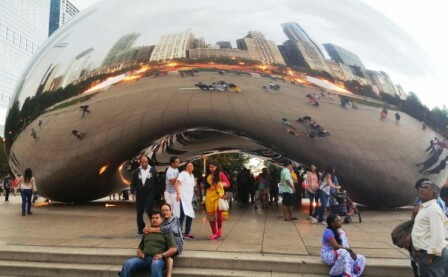 commonly known as “The Bean,” is an elliptical sculpture which reflects the skyline and intrigues visitors who walk underneath and all around to take photos, often reflections of themselves. Crown Fountain is another winner. 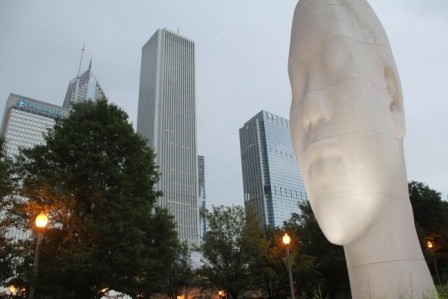 Spanish artist Jaume Plensa is the genius behind two 50-foot glass block towers at opposite ends of a reflecting pool. 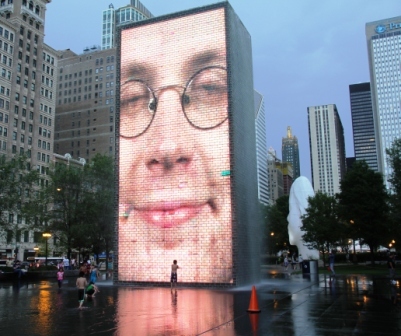 Gigantic faces of Chicago citizens are projected on LED screens on the towers, changing continually, with water flowing from open mouths. You can be mesmerized for hours. BB bridge leading to the Jay Pritzker Pavilion, right corner. 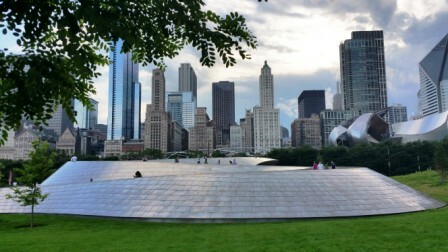 We walked up the BB Bridge in the park to the Jay Pritzker Pavilion, a venue for outdoor concerts, both cutting edge architecture designed by Frank Gehry. We had hoped to take in a free concert, but rain drove us away after the first selection. 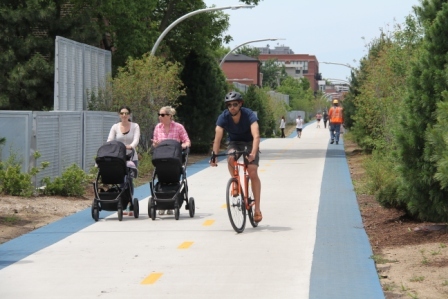 Another day we walked a section of The 606, an elevated trail for hikers and bikers similar to New York’s High Line. It was built on a section of the Bloomingdale rail line no longer in use. 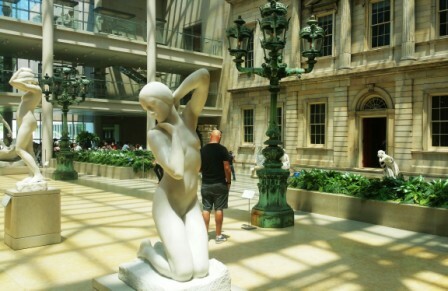 When I lived in Chicago, I loved the Art Institute, the second-largest art museum in the United States after the Metropolitan Museum of Art in New York. It has expanded, with a new wing designed by Renzo Piano. 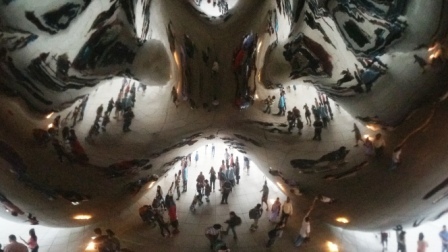 I did not have time to visit, a reason for a return to Chicago. Time to join BB/VR in Winchester, Virginia, where he was visiting his son Rob and grandsons Samuel and Lang. I left Bev’s townhouse at 11 a.m. and did not arrive at Dulles Airport outside of Washington, D.C., until 11:30 p.m. that night. I was traveling by air – not car – although a car may have been faster. I spent most of the day in airports or in a plane that never took off. Delays due to bad weather and mechanical problems, I was told. Give me the TGV (France’s fast train) any day! 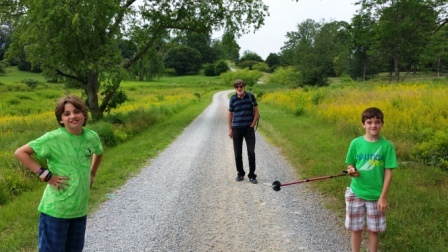 In Virginia we took the boys on a delightful but short hike in the Virginia State Arboretum, following a trail bordered by grandiose trees. We encountered few others in this peaceful wonderland of nature. It’s another place that merits a return visit. 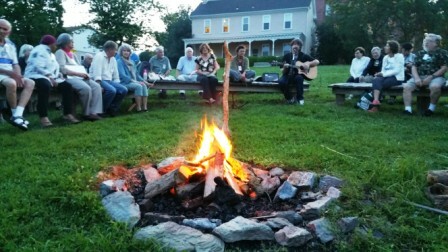 Next stop Adamstown, Maryland, where my Peace Corps training group, Brazil 1966-68, was holding a reunion at a camp and retreat center. 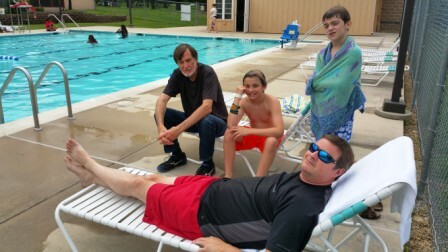 Rob and the boys joined us and, when the rain stopped, had fun in the pool. I met old friends, attended some interesting lectures and presentations, including one on the Peace Corps today which, like Brazil, is not the way we knew it 49 years ago. En route to the reunion, we made a detour to La Vale, Maryland, the home of German Life, a magazine I write for. At long last I was able to meet the editor, Mark, in flesh. Ours has been an email and occasional phone call relationship for at least 12 years. Mark went overboard and treated us all to lunch for making the trip. Thank you, Mark. 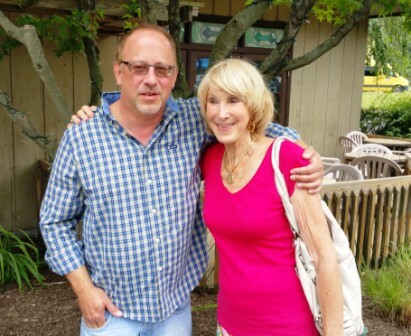 I left the reunion site for a lunch break to reunite with a high school friend, Marian, who divides her time between residences in Bethesda and Annapolis, Maryland. She filled me in on news of other classmates. The 9/11 Memorial was a must on our New York agenda. 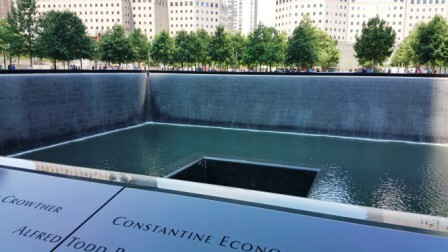 Names of the 2,977 victims of this horrific tragedy are emblazoned on bronze plates attached to parapets of the walls that surround two rectangular pools, one for each tower destroyed in the attack. It is a beautiful, but chilling monument. Looming above the memorial is the new One World Trade Center (Freedom Tower), the tallest building in the U.S. We passed on a visit to the Memorial Museum as the entrance waiting lines were very long. 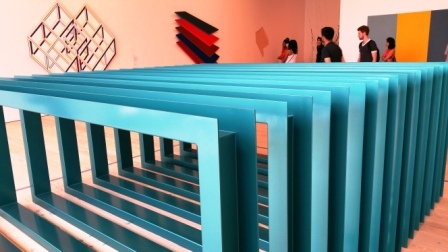 No lines at the new Whitney Museum of American Art, an interesting structure with intriguing outdoor spaces, and amazing art. 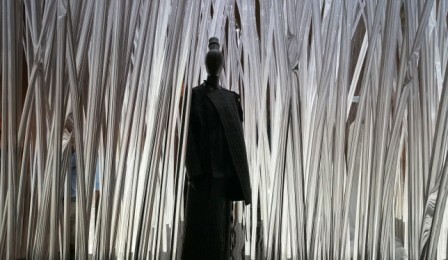 I conquered the subways and went to the Metropolitan Museum of Art. So much to see, and all terrific. Must go back there, too. 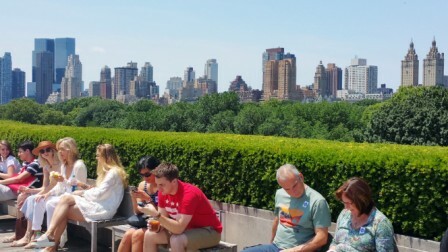 Rooftop terrace at the Metropolitan Museum of Art. We joined Kellie and a friend for Shakespeare in the Park (Central Park) and a performance of The Tempest. I met Michaela from Switzerland Tourism for lunch. 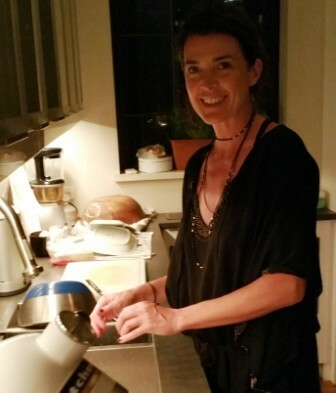 Thanks to Michaela, I have been on many wonderful press trips to Switzerland. 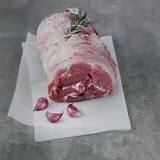 A closing word on food in the U.S. We have often complained about the high costs of almost everything in France. No more. The dollar’s recent surge has, of course, made things cheaper for us here. We were shocked at some U.S. prices: $14 and up for a glass of wine in NYC; $10 for 2 cups of coffee. Restaurant prices vary, of course, but eating definitely seems cheaper on this side of the Atlantic. 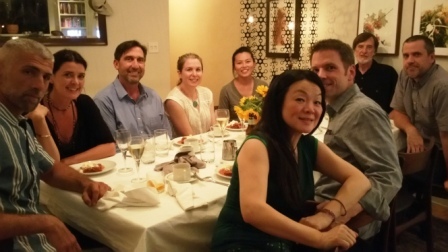 In the U.S., a restaurant bill is just the beginning. You need to figure another 20 percent for tip, then a percentage for tax. On the positive side, we found some clothing bargains, and BB came home with a new toy, a MACbook. A wonderful trip, great to see family and old friends, but it’s good to be home. We just wish this heat wave would end. For more photos of my U.S. trip, keep scrolling down. 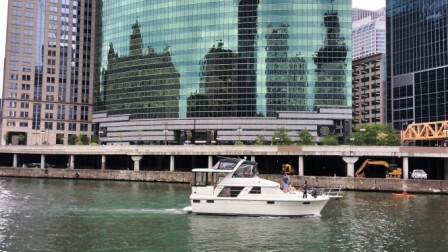 For a super architecture tour of Chicago by boat: Chicago Cruise Line. BB, Sam, Lang and Rob enjoy pool at reunion site. 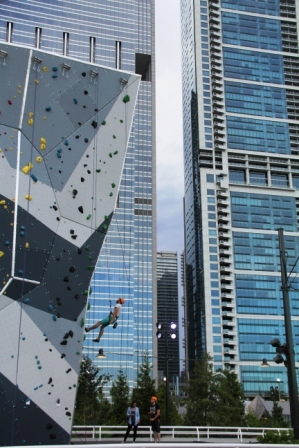 Climb a wall in Maggie Daley park next to Millennium Park.